We help you achieve it! 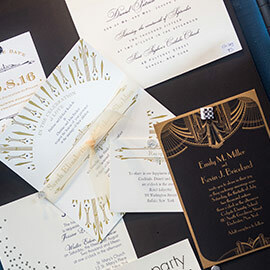 The process of selecting an invitation package, creating it and seeing the finished product involves many things and is very much unique as you are. 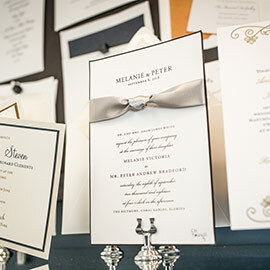 There are many things to think about as you prepare to order your wedding invitation package. 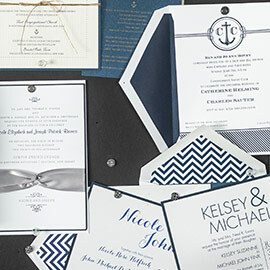 Invitation styles and color choices are virtually limitless, encompassing a broad range of pricing. PaperRozzi helps you with all of this in a way no other vendor does. We work with you to achieve the vision you have for the invitation package you desire. At PaperRozzi, the finished package is in the details! Start with a visit to PaperRozzi. With so many choices that you will be making, our guidance helps you to coordinate the style of your invitation with other major choices you will have to make like your dress, reception decor and more. Our experience helps you with the many questions you may have - so you can enjoy the process. We help you select wording, type faces/fonts to use, ink color choices, layouts and design of the actual invitation and coordinating pieces. There are so many little details that PaperRozzi helps you with (that you may not have been aware of) to make your invitation package special and exactly as you envision it to be. We look at all the necessary wording you require, essential dates regarding when the invitations are sent out and when responses are needed for you. We also perform a very complete proofing process on your invitation information and design so that your invitation, once printed, is exactly what you ordered with the right quantity and the quality shown before the final pieces arrive. Once your invitation package arrives at PaperRozzi from the printer, we check it in for accuracy, correct quantity and quality before we notify you. If you have selected any extra services that we provide - like assembly, stuffing, applying postage, addressing, etc. - those require additional time and an estimate of costs are given to you at the time of your order. At this point your invitations are ready for you to stamp, stuff, seal and send out to your guests! We love what we do and know you will be happy with what we help you achieve. We can also help you select invitations in the range of your budget, whether it be casual or a very elegant elaborate event. Start with PaperRozzi for your invitations - we will put the finishing touches on for you! You won't be disappointed!